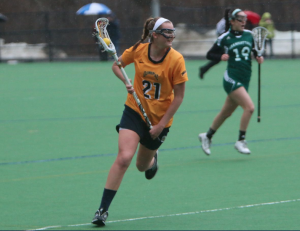 Quinnipiac women’s lacrosse player Kyra Ochwat has been named this week’s QBSN Athlete of the Week. Ochwat, a junior, had four goals and two assists in the Bobcats’ 12-11 win over Manhattan on March 29. The Farmingdale, N.Y. native also had two goals and two assists in the Bobcats 10-9 loss at Monmouth on April 2. The Bobcats (1-8, 1-1 MAAC) return to Hamden on April 6 to take on Canisius.